When MOSS 2007 came out I created a blog post very similar to this one. It turned out to be one of my most popular posts and I received many comments and private emails thanking me for putting the post together. Since the post helped out so many folks I decided to create an updated version for SharePoint 2010. SharePoint 2010 ships with many predefined site templates you may use to create site collections and sub sites. Sometimes the out of the box site templates will meet the needs of your project. Other times, the out of the box site templates may need to be enhanced. Knowing which site template has the functionality you need to deploy, or use as a baseline for a custom site definition, is one of the key decisions you make when you architect a SharePoint deployment. This being said, it is important to understand the templates SharePoint 2010 comes with out of the box and what sub sites, lists and pages they support. This post outlines the site templates SharePoint 2010 comes with out of the box and what sub sites, lists and pages they support. As usual, I’ve documented several useful pieces of information developers will find handy when working with the out of the box SharePoint site templates. If you install Silverlight on your machine you’ll be presented with a fancy new interface to create sites (shown below). As you can see, SharePoint 2010 offers some guidance when creating new sites by providing descriptions and preview images for each out of the box template. However, not all of the descriptions list which resources the site comes provisioned with and the preview images are no help at all. See the image below, I think you will agree. To better understand the inventory of out of the box site templates, I created a site collection based on each out of the box site template. After creating 29 different site collections (that’s 6 more than MOSS 2007 if you are keeping track) I realized it would be hard to remember what each one looks like and what resources they offer. So, I decided to take some screenshots and document the site templates. The file names for the preview images corresponding to each site template are listed in the tables below. If you care to see what each of the home pages for the site templates look like you can download screenshots of each and every site template in this zip file. The screenshots should provide you with a good understanding of the different layouts that come with each out of the box template. This should save you a lot of time creating each type of site template on your own machine! 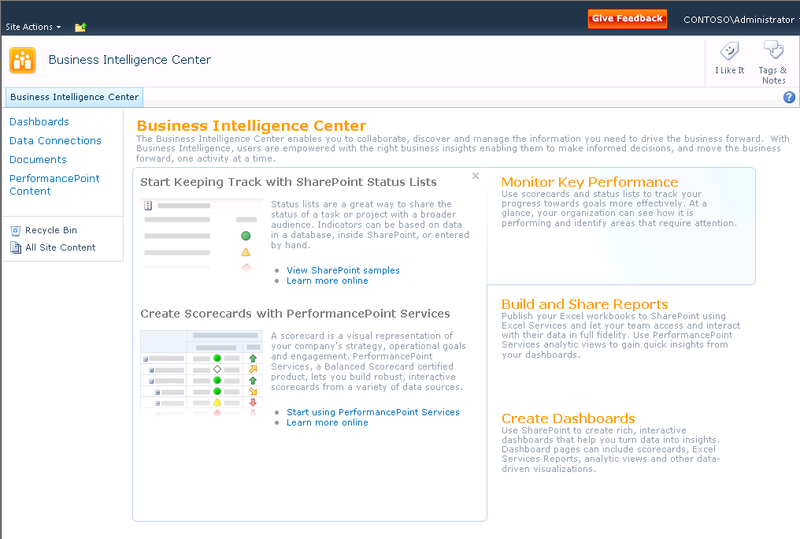 Here’s an example, showing the new Business Intelligence Center; oh how fancy! Important planning information related to the out of the box site Templates! The next table lists the WEBTEMP XML fragment files each site template and configuration are defined in, the concatenated template and configuration string you need when making sites with the site template programmatically, and the file name of the preview image. If you wish to change the out of the box preview images I recommend backup up the existing preview images, then replacing them with your new preview images that have the same file names. Feel free to use the images I created from screenshots of each site template’s out of the box home page to do so. You can download them here. Note: You may have to perform this process again after a service pack is applied in the future. Editing the various WEBTEMP files that come out of the box is not a recommended approach; that’s why I recommend this approach. As I mentioned before, knowing which sub sites, lists, and pages are available within a given site template are key pieces of information you will want to know when you architect a SharePoint solution. 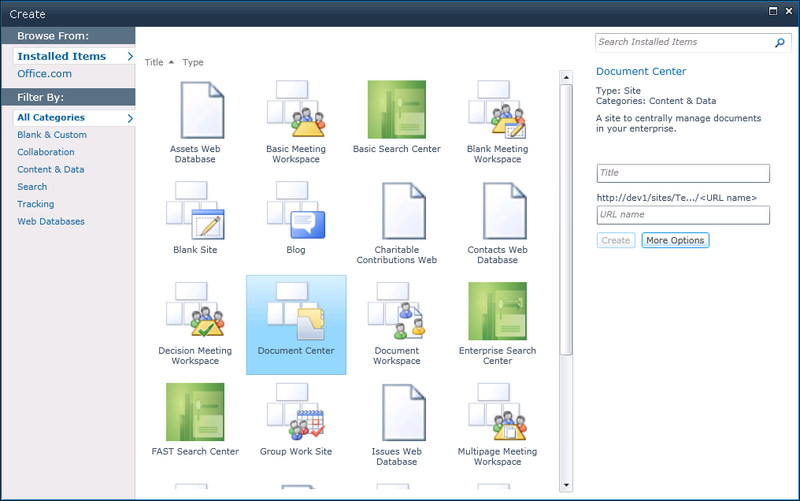 The following site templates are new to SharePoint 2010. The following site templates are deprecated or removed in SharePoint 2010. Many of the site templates listed in the following table are left over from the previous versions of SharePoint and are marked obsolete. However some of them may be created programmatically. I included the list of all the hidden site templates here for reference. The concatenated template and configuration string is used when creating sites programmatically. See the last line of code below for an example. //Description: This is the description for my new site. Once again, I hope this post comes in handy for you and saves you the time I spent digging through the SharePoint file system and creating dozens of SharePoint sites to find the information. All the information in this post comes from the public beta 2 version of SharePoint Server 2010. I’ll update this post once SharePoint 2010 goes RTM. Joe Gasper collated the information in the tables which appear in my blog post into an Excel Workbook. You can find it here. This is helpful – thanks for the post Todd! Hey Todd, great post! One mistake I noticed – the Document Center config should be 0, making the concatenated string "BDR#0". The ID of the site definition is 7, but the config ID is 0. Document Center’s concatenated string is actually just BDR. This is awesome. Very much needed Information! Thanks Todd! fantastic post to have a quick look on the available template and other stuffs on sharepoint. I found those dropdowns not working? is it my browser or something wrong? I found those drop-downs not working? is it my browser or something wrong? This is great information, however I still need to see the scope of each template, appreciate your feedback, thank you. Nice article. I just stumbled upon your blog and wanted to say that I have really enjoyed reading your articles. Anyway I’ll be subscribing to your feed and I hope you post again soon. There is also a PowerPoint Broadcast Template if OWA’s are installed as per my list http://www.wssdemo.com/Lists/SiteTemplates/AllItems.aspx whichalso shows the SKU required for the template to be installed.